Trains and Firefighters how cool is that! A newly released Thomas and Friends Rescue on the Rails DVD is full of firefighting action with the fire engine Flynn. Flynn was a new character to us when we saw him in "Day of the Diesels", still one of my son's favorite Thomas movies. It was great to see Flynn back in action saving the day on the Island of Sodor. Ready to Rescue! The Sodor Search and Rescue Team is racing to the rescue -- Bertie's stuck on Shake Shake Bridge, Gordon's derailed and Thomas' firebox is on fire! In these exciting episodes, your favorite engines brave the rails to rescue their friends. Discover that being heroic is more than having speed and strength; it's about teamwork and a big heart – which puts every Really Useful Engine on the right track. This Thomas & Friends Adventure on the Tracks 6-DVD Set is great! My son loves putting the DVDs in the player and telling me "Okay Go" so I can push play. Sometimes when he says it I like to be ready with the remote so he thinks he made it work. 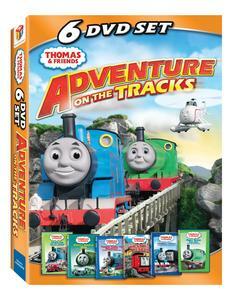 Having 6 new DVDs from this Thomas set made is day! He is more and more of a Choo Choo aka Thomas and Friends fan with each DVD he sees. I love that he enjoys trains and hearing him say Choo Choo is beyond sweet! Discover laughs and surprises around every bend! Thomas thinks he's seen a ghost, Percy puffs into a giant pile of hay, Oliver encounters some troublesome trucks and Donald and Douglas rescue a mischievous engine. Bonus DVD Game: Who Am I? Always expect the unexpected on the Island of Sodor! Thomas gets a surprising push from a jet engine, Percy lets his imagination run away with him, Harold makes a horse fly and Salty and Fergus prove they're useful on and off the tracks. Thomas and his friends discover that fun and excitement never end! Join in the adventure as little Rusty sets off where only big, brave diesels dare to go and Duke gets rescued and reunited with Stuart and Falcon. Learn the importance of listening to others when Thomas ignores Percy's wobbly track warning, Rusty sets off to save a reckless Duncan and Fergus proves himself to be really useful. 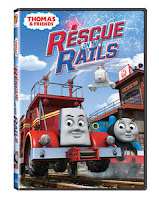 Everyone learns important lessons about good behavior when Thomas shows off a little too much, Diesel causes trouble between the other engines and Gordon finds out that sabotage can backfire. Find out how just how much the Steamies and Diesels have in common when they put aside their differences and start working together to keep Sir Topham Hatt's railway running smoothly.